or whatever other engine but the original engine type. myself that with some ingenuity, time and some resources I can build an engine that will perform in my Time Trial Duntov Fiero. The goal is 250WHP out of a Naturally Aspirated 3.4 iron head engine with explosive mid range and killer top end. This will be on a stock bottom end, head work, custom cam and Intake and a stand alone ECU. Note: Some items information will not be disclosed. to have a competitive power to weight ratio. This is kind of like watching a build of a Ford V8-60 flathead where one just asks "Why?" factory items. 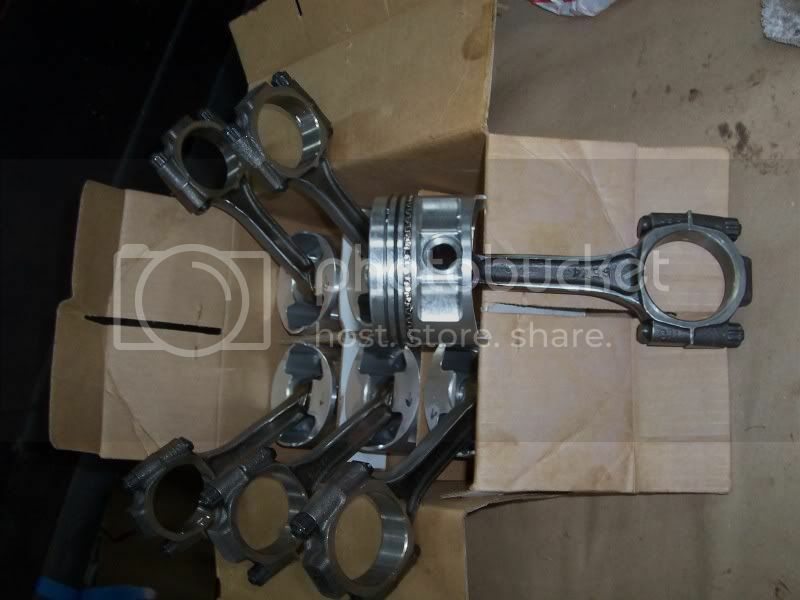 Specially the stock intake and exhaust manifold, camshaft, TB, "Y" pipe and exhaust pipe diameter. RPM range but it was also important "how" that power was delivered withing that RPM window, it had to be EXPLOSIVE....! With that idea the Supernatural concept was born! was designed to the RPM window in mind. 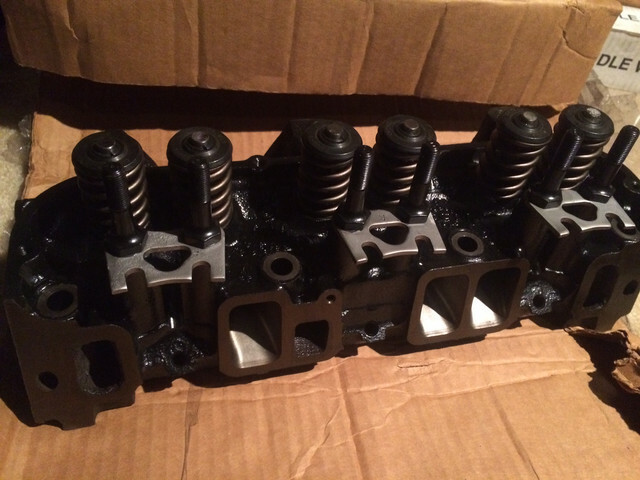 Port work and valve size was designed to match the intake manifold, exhaust header and Y pipe flow capabilities. no sense in installing the head and intake with the cams and springs available over the counter. smaller or bigger and that is a plus to match the cam to the track. the cam lobes with pressurized oil to lube and cool the lobes at the same time. of racing springs and narrow full aluminum roller rockers available for the SBC V8. Next we will compare with pictures some stock vs Supernatural items. STAY TUNNED!! I'm sure the non-Fiero people look at us building up Fieros in much the same way. 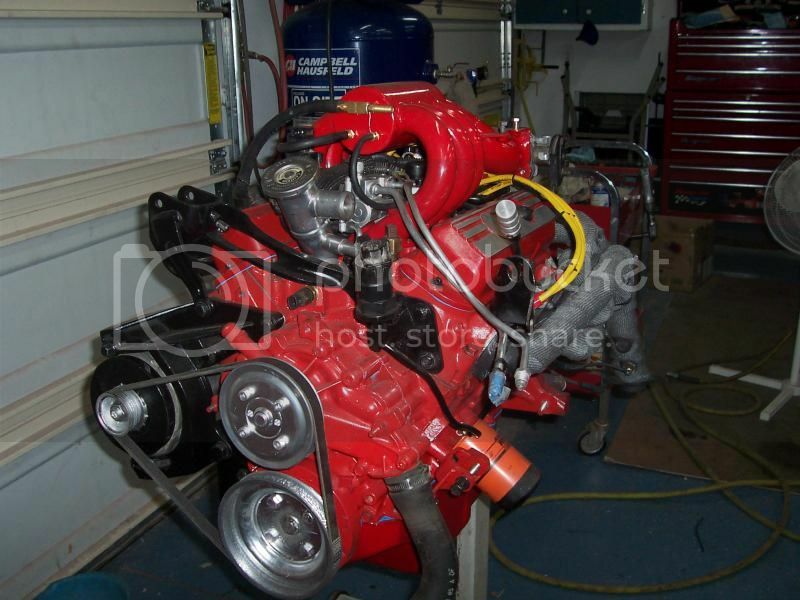 The goal of 250 RWHP from a 3.4L pr engine is a very aggressive one. I've built these engines and even with a turbo have not reached this goal. You can improve the performance but the engine breathes poorly. With loads of boost like 20 psi you might reach your goal but N/A I say no way. Next, lets start to put the engine together! With loads of boost like 20 psi you might reach your goal but N/A I say no way. 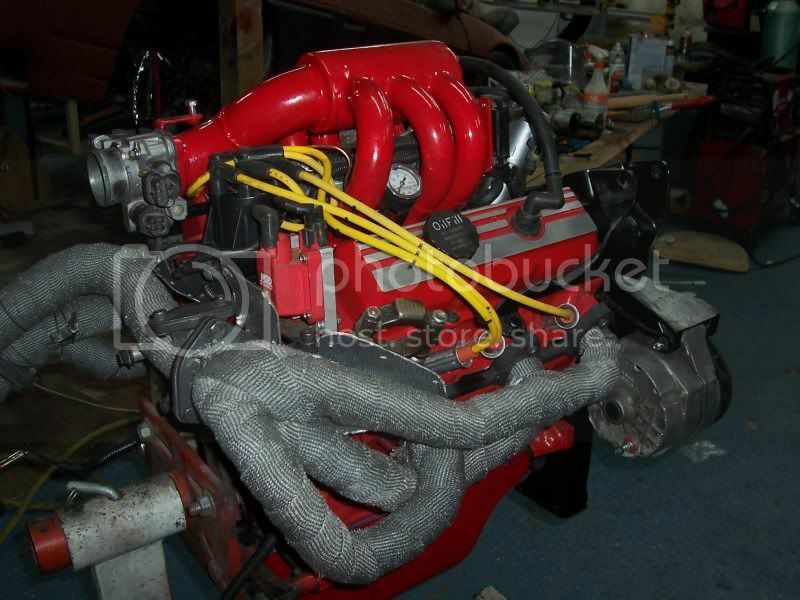 Hello Dennis, the goal of my engine is NO TURBO, NO JUICE, 250WHP NATURALLY ASPIRATED @ 6000RPM. 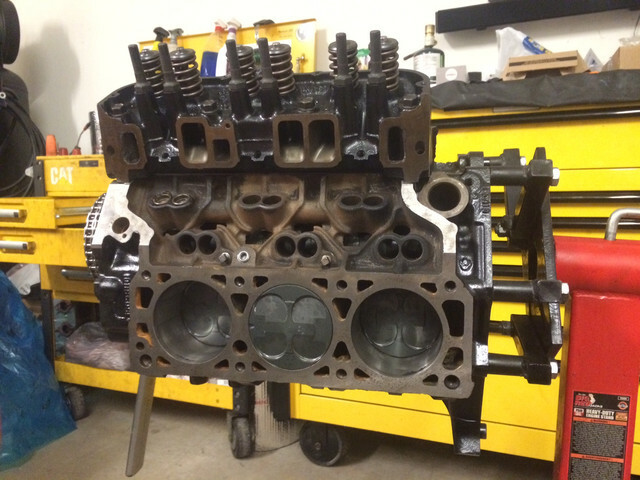 3.4 PR IRON HEAD ENGINE. I completely understand your concern in me not reaching that goal, but I'm absolutely sure I can. So, just be patient and wait and don't ruin the expectation for the rest. Just relax Dennis! The last dyno he posted was 240 RWHP. I'm sure he can find another 10 HP somewhere. Just because you can't do it, doesn't mean he can't do it. He is already at 240 whp on a mustang dyno, so there is clearly an opportunity to learn something from him. La fiera is shifting paradigms and that is great! Just switching to a Dynojet and he is over 250rwhp. He was also using heavier than stock wheels. Honestly, looking at the heads, his are smoother but mine are ported a little more. That said - smoothening goes a long way in maintaining air-velocities. I like how each of the openings on that twin-butterfly TB is larger than the original Fiero TB. 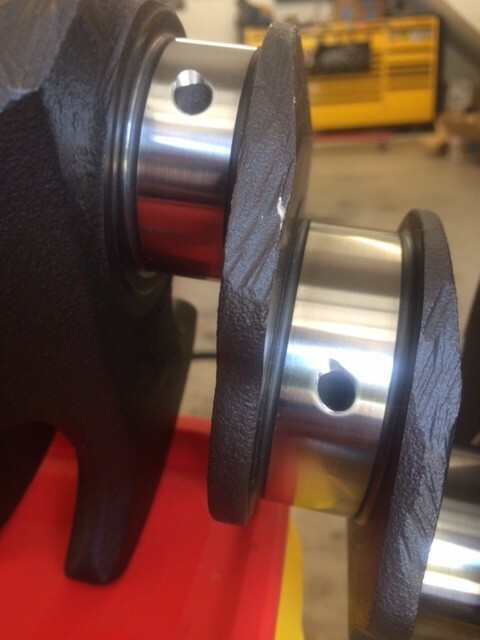 twin-58mm vs 52mm stock and 56/57mm ported. I'm using the Firebird twin 48mm TB myself. But hey, we have different builds/goals with similar mindsets. What kind of injectors are you using? They look well targeted, shooting down low. Do they spray in a thin pencil, with perhaps less atomization/hp, or do they spray a wide fan mist, but with the possible consequence of a larger fuel puddle, and worse response? Are you using Enhanced Acceleration Enrichment (for non-MS folks, this means transient compensation that is based on a wall-wetting model)? It looks like the entry of the intake runners are tapered, so even though you probably don't have trumpets hidden in the plenum, it effectively does the same thing as trumpets. I like it. the Wall-Wetting effect. But then I learn I can program the Wall-Wetting in the MS!! So technically is a Tuned Port Tunnel Ram! I also made the runners SQUARE instead of ROUND to get as much volume and flow as possible. the flow would slow and killed the performance. I am relaxed and certainly wishing you all the best on reaching your goal. Just believe that it will be an expensive build with a difficult platform on which to reach that goal. Not saying that it can't be done . Well thank you Dennis! For me this is a labor of love and I have more time than money invested in the motor. I've spend $2870 on the motor. That includes all the parts and the machining, No R&D and no labor time. I don't think we can put a price on the satisfaction we get when we achieve a goal! 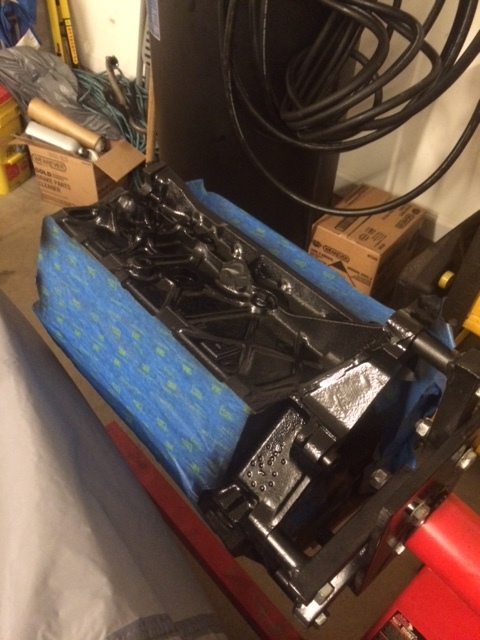 Block painted after being received from machine shop and ready for assembly! Before installing the crank I did some mods to improve oiling at the rods and mains. I know I could've made that mod better but I did that like a fast job. it will be for this block but with a much higher HP goal, same thing; NA. 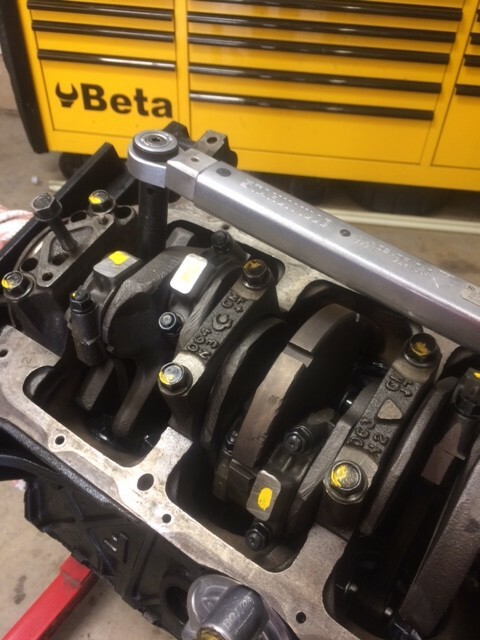 Crank dropped and ready for torque! There's more to come, stay tuned! Here's my attempt at 220+ HP @ 6 - 7+K rpm with a norm asp 2.8 engine. It's in the car waiting for me to complete the paint / body mods, get some dyno data and burn a chip. Hopefully we'll both meet our goals! Looking nice Francis!! Can't wait to hear it wail!! Keep up the good work! Isn't a good crankshaft, a good crankshaft, period? What would you do for an NA engine's crankshaft that wouldn't also be good for an engine having a power-adder? It takes power to rev up an engine. The less mass the engine has to spin up, the more power can be delivered to the wheels. so I can get a shorter and lighter piston. mentioned and my goal for that set up is 300+ WHP. But that is going to take a little bit of time. my power to weight ratio for the same reason, less weight = more usable power. I would suggest limiting your targeted peak power to around 5k - 5.5k RPM if you have an iron crankshaft, especially with a 3.4 - which is a stroked 2.8- too much reciprocating mass. 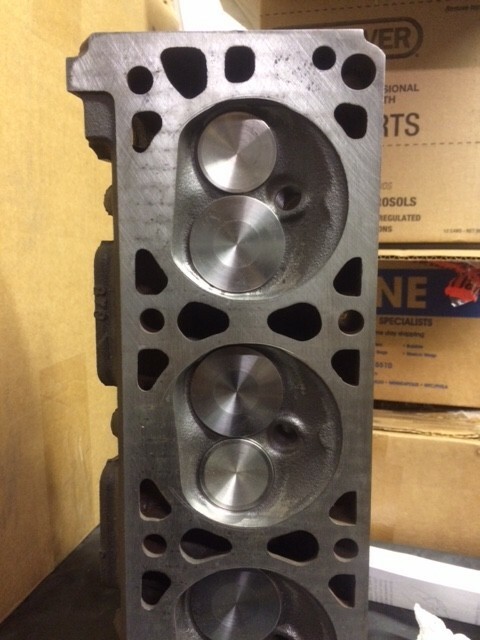 I got lucky - cost me $110- and brought one of the last -discontinued- Eagle STEEL crankshafts, else I would not have built my 2.8 for high RPM use. BTW Venola makes good forged pistons that are priced good. with a turbo have not reached this goal. You can improve the performance but the engine breathes poorly. 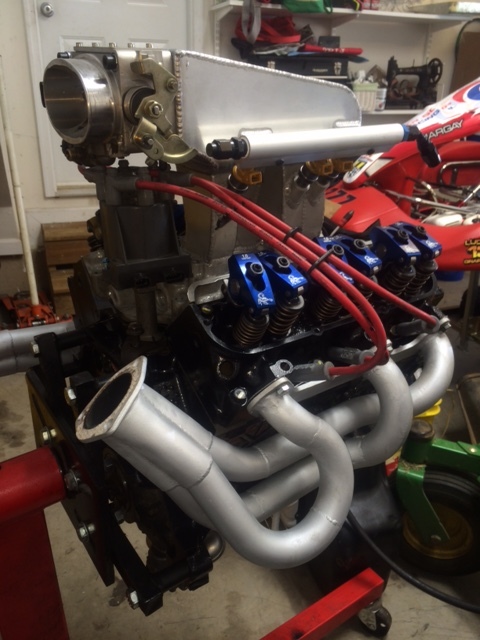 We've -trueleo racing- have seen our customer's 2.8 engines with our headers and intake manifolds make more than 210HP and those were with stock or mild cams, stock heads, stock pistons, and stock ECU chips! BTW on the flow bench with our intake the 2.8 iron heads flowed enough CFM to support 300+ HP. It will no-doubt take a lot of dyno time and probably, more than a few chip burns to get the tuning spot-on. That said, I don't think his or my goal HP is impossible. 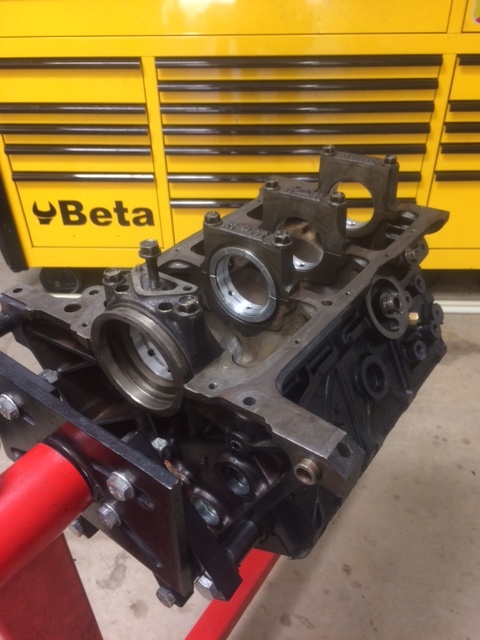 NOTE: I did not state the above to get new customers, whereas do to my medical issues and my son's very successful road racing program, we no longer make products for the 2.8 - 3.4 engines. The 3.4 V6 bottom end is safe up to about 6500-7000 RPM (assuming it's in good condition). But anything beyond that is pushing your luck. Looks like Rei is going to improve the odds with lighter weight pistons and rods. That will push the RPM envelope a little higher. Edit to add: for what it's worth, I'm going to be following in Rei's footsteps. Although I won't be taking the engine build quite as far as he is. 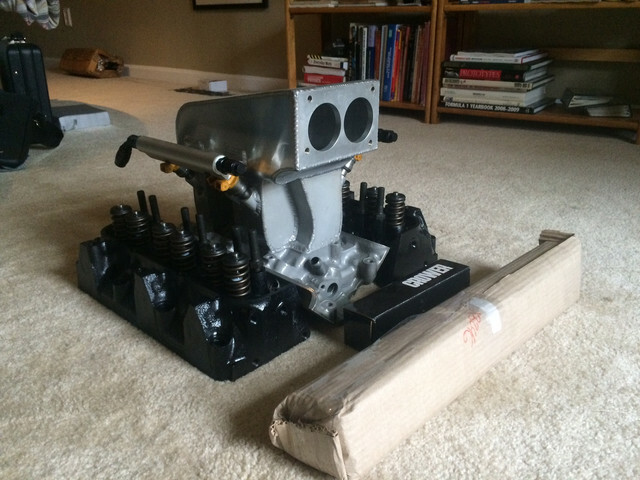 But I also have a crazy intake manifold (from Ryan Falconer), and a "secret weapon" camshaft that Rei made for me. Plus the heads will be race ported. And I already have the Trueleo headers. Should make for a lively engine. the MegaSquirt I prefer the rev limiter method. The car just pulls like a freight train non stop in all the gears, I love my 4:10 gears with the welded diff!! Edit to add: Can't you select what the ECM does to limit the revs? I know with my 7730 setup, I can have it retard the spark, cut the fuel, or both. Maybe there's a setting in the MegaSquirt for that? I also have the high rpm decel (7100 to 4500) at -0.3 timing and enriched on purpose it makes loud poping sounds and the flames can be seen from miles!!! I have it like that so it can help with the scavenging of the exhaust thus increasing my intake draw in also. It works pretty good and keeps my throttle response sharp. I have stainless steel racing valves designed for that torture. One thing I tell you, you know when you see most of the cars when they hit full throttle and all you see is black smoke? You don't see that in mine, mine burns clean and the AFR's are right on target. But don't worry, once you are ready just let me know and I'll make a special trip! It makes loud poping sounds and the flames can be seen from miles!!! Yup unspent fuel meeting say a hot muffer would do that. Back in my younger, more devious days before the invention of steering wheel locks, we discovered that turning the ignition off for maybe 5 seconds on say a highway and then back on would produce a nice loud boom. It could and often did explode the muffler. Yeah, we used it to scare AHs on the highways. Lol it was especially effective when going through an underpass. To avert such you may want to cut the fuel off too. On my turbo Fiero, the limiter was set to simply cut fuel - there was no popping, the fire just went out if you exceeded a certain preset boost pressure or if there was knock. Very disconcerting if you aren't used to it - you wonder what you blew. Most spark limiting systems just eliminate every other spark to the plugs and the engine still runs but 'goes flat' without allowing any increase in engine speed. I grew to appreciate the over-boost limiter - only happened occasionally on long straights using full boost. Prep the bores for piston installation. I used my own assembly lube. Its hi in MOs2 thus the grey color. This dry lubricant is also a shield for hi temperature. Rings gapped for my application and going in. 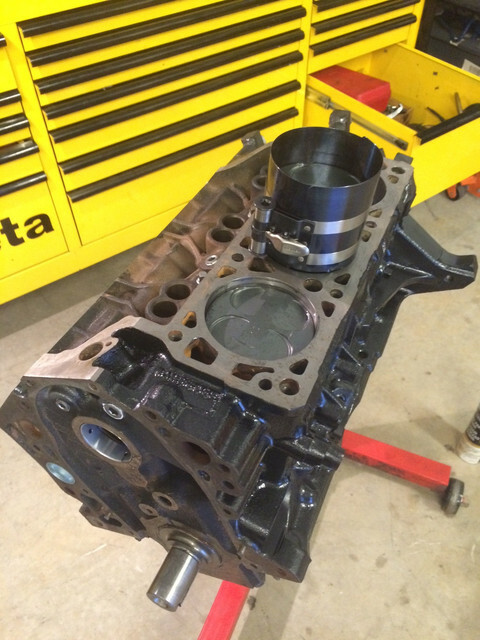 The block was decked to purposely have the crowns of the pistons protrude out. 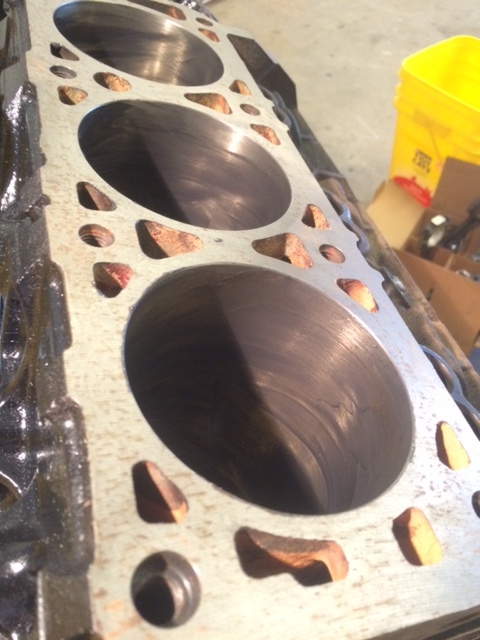 and the gap between piston crown and engine block is pretty wide. Torque mains and rods to the specified torque and mark them as you go along! The bearing clearances of the mains and rods have been checked already. I opted to be on the looser side so I have to use 10w-40 and up oil. Next is the cam and lifters. Besides lubing it up I apply a coat of dry MOs2 lubricant! 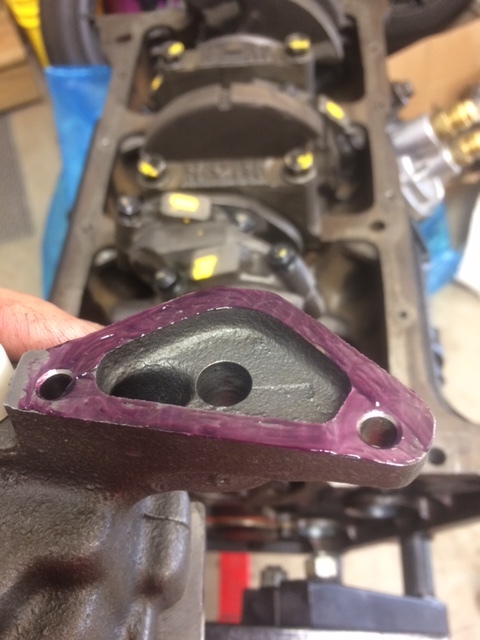 oil to the cam lobes. Now you know why I opted for the HV oil pump? Install timing chain. I chose the Double Roller for this motor. the stock chain stretched considerably!!!! So, I learned my lesson. Make sure to apply plenty of assembly lube between the chain, sprockets and slider. Next, the heads go on. And I will reveal with what compression ration I ended up with! Stay tuned!! 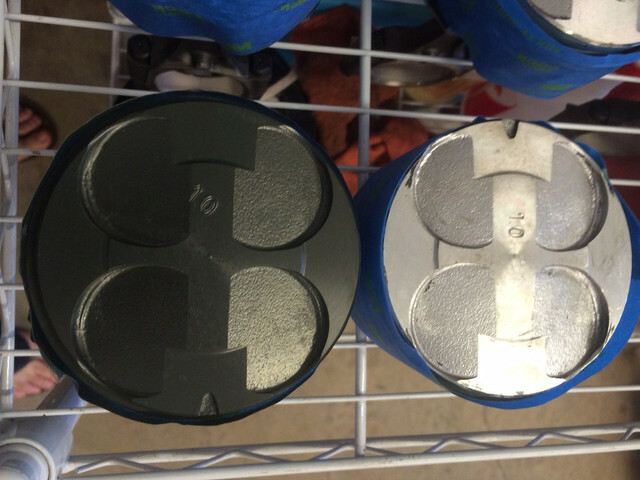 What's the idea of putting the MoS2 stuff in the cylinder bores? Won't that slow down the ring+bore break-in? Obviously, the engine seems to have been a success, but I'm not sure if that step was a good one. 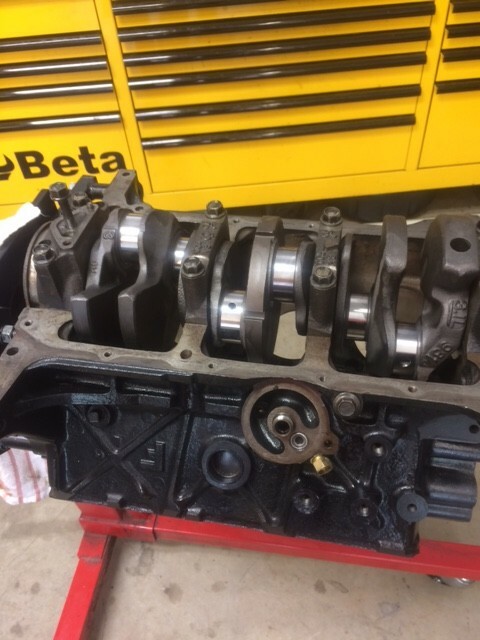 Is the camshaft black because it has been nitrided? And how did you drill the lifters without leaving a burr? because it requires energy to overcome the friction. In the other hand MoS2 and WS2 don't have that problem, the opposite happens. I add MoS2 solid lubricant to the assembly lube to be safe when turning the engine for the 1st time. I use Comp Cams mineral 30W Breaking Oil for the first start up and 30 mins of engine running. I also drive the car with the breaking oil and do plenty of accel and decel at different RPMs to seal my rings. The following oil change is a 10W-40 rich in MoS2 and good ZDDP, so MoS2 is the main anti-friction additive. I've built many engines and the follow this procedure and have never had an oil comsumption problems due to rings not sealing. The camshaft is coated with MoS2 dry film before the assembly lube is applied. The lifters are made that way. Its called "Cool Face"
The Camaro pump and screen where used because the screen pump hole and the screen pipe are bigger diameter. 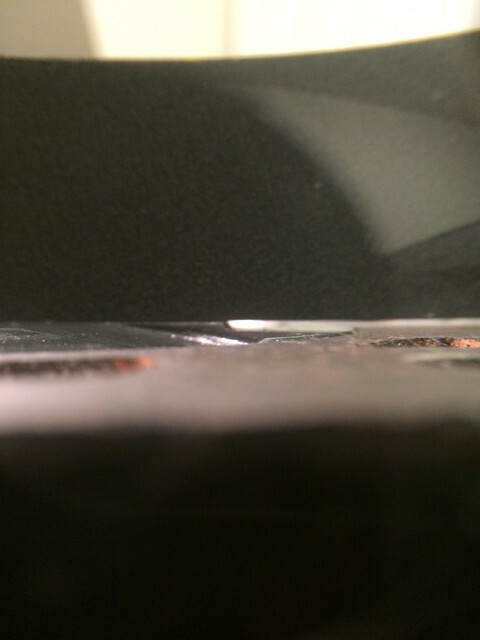 The pump mounts without a gasket but I always use liquid gasket between the mating surfaces to create a tight seal. Bottom end ready for the top end! Lets put some heads up! After torquing both heads the rockers are installed and lashed! Intake and headers on and torqued. If you want a REAL harmonic balancer, this is it. After shredding the stock one apart because it couldn't take the RPM I decided to to do some research and found this is the best of the best. Engine revs so fast, free and clean!! I'll never go back to stock! 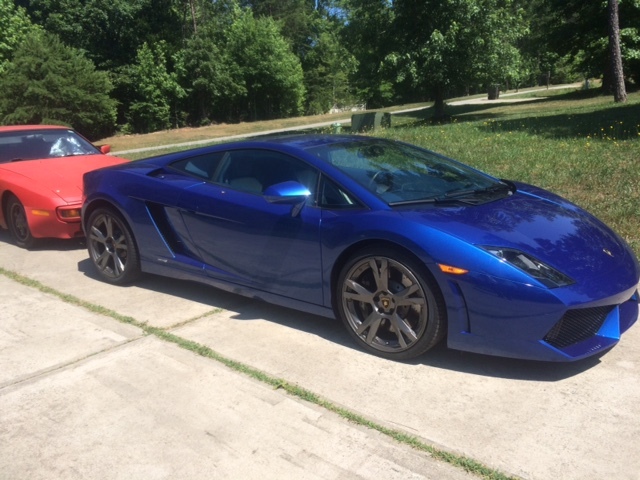 I need some money to keep up with the project so lets work on some expensive cars! I love this part of my profession. People buy Lambos and Ferraris and Porsches and I drive them for free!!! I am a fan of Mos2 as well. Whats your opinion on running an oil that comes with moly in it all the time, not just break in? Or Moly additives? New or old engines. Do you have a list of car lightening mods? This is the oil I use in all my cars. I have used it for years and never had a problem. It is a REAL antifriction oil. It has 1200ppm of Phosphorous, 1100ppm of zinc and 1300ppm of Mos2 if I remember right. You can get it in at Advance Autoparts now since they bought WorldPac.